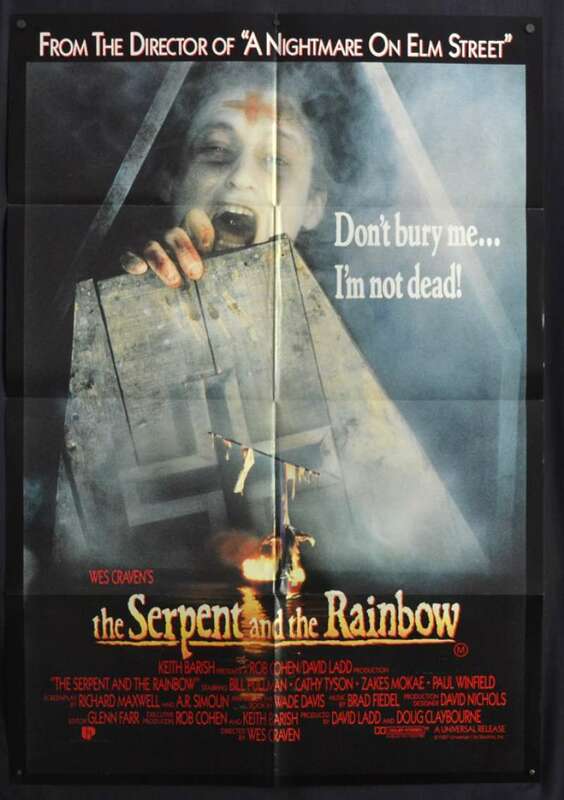 Original Australian One Sheet movie poster.The Serpent and the Rainbow is a 1988 American horror film directed by Wes Craven and starring Bill Pullman. The script by Richard Maxwell and Adam Rodman is loosely based on the non-fiction book of the same name by ethnobotanist Wade Davis, where in Davis recounted his experiences in Haiti investigating the story of Clairvius Narcisse, who was allegedly poisoned, buried alive, and revived with a herbal brew which produced what was called a zombie. Davis had agreed to sell the rights for the book on the condition that Peter Weir would direct and Mel Gibson would star in the film. However, neither Weir or Gibson would be involved in the project. Wes Craven eventually signed on as the film's director.